Apart from innovative tablet/laptop hybrids, Asus had three good old-fashioned Android slates to unveil today at the Computex 2014 expo. These belong in the Asus Fonepad and MeMO Pad, and are all powered by Intel's new Atom line of mobile processors. This makes the Fonepad 8, and the MeMO Pad 7/8 all 64-bit Android 4.4 KitKat devices, so let's recap what each one offers. The Fonepad 8 seems to have the slowest, 1.8 GHz Atom Z3560 version of the quad-core processor, but it sports 3G connectivity, and Asus also managed to place an 8" 1280x800 IPS-LCD display inside, and surround it with just 5mm bezels. This makes the Fonepad 7 sport the best screen-to-body ratio amongst all 8" tablets out there, at 72.2% ratio. The tablet also flaunts dual stereo speakers, situated at the front. The MeMO Pad 7 also has two stereo speakers, but comes with a smaller display, and powered by a 64-bit Intel Atom Z3745 quad-core processor. Asus put a 5 MP camera on the rear of the 7-incher, and an HD 720p display in this one. 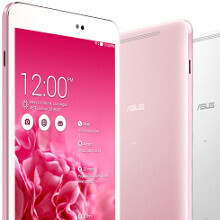 Another superlative comes in the form of the MeMO Pad 8, which Asus touts to be "the world’s lightest 8-inch LTE tablet." As the phrase implies, this is the Cadillac of the new Asus tablets, as it sports a 1080p resolution stuffed in an 8" display, a 64-bit Intel Atom Z3580 2.3GHz quad-core processor, and fast 802.11ac Wi-Fi and LTE connectivity. Not only that, but the MeMO Pad 8 has a premium multi-layer metal coating for the chassis, weighs just 10.55oz (299g), and is only 0.29 (7.3mm) thick to boot. The three new Asus tablets are sporting a thoroughly overhauled Zen UI overlay, which the company touts to be "featuring over 1000 software enhancements and a new visual design." The redrawn interface is executed in the modern flat style, and introduces entirely new themes, transitional animations, notification sounds, and ringtones. Any takers? Rather buy a laptop than a tablet. That's correct. Know any laptop that has Accelerator, GPS, Gyroscope, barometer and etc sensors. Different needs different tools. I am in the neighborhood for a small tablet, something to tide me over until the Tegra k1 comes around. But I am looking at an HTC One max. 1080 p screen boom sound speakers and a battery expanding case (adds 1200mah, bringing it to 4500mah!) that doesn't interfere with the micro usb port.Yes, I plan on buying a phone just to use it as a small tablet. these are rather un remarkable, I expected more from Asus. Not a very large one though. Although 64-bit systems allow for 4+ GB of ram, the main motive behind moving to the new instruction set is more efficient storage, I/O and system performance. The storage on 64-bit systems is more secure because it is allocated to randomised blocks within the storage, which can't be predicted as easily by a hacker, as compared to 32-bit systems with linear structure of storage. Also, the 64-bit systems allow for higher memory bandwidth and better backwards compatibility and more efficient R/W from the random entropy generator, thus tackling any kinds of stutter which might have happened due to slower storage. Nice,too bad they killed em with "Incompatibility Inside".